Students say the best teachers get them excited about learning, stretch their thinking, and keep them actively involved in class. But with increasingly diverse classrooms and constantly changing technology, each semester throws up new challenges for engaging students. Readers will delve into what learning feels like from a student's perspective, as well as absorb the wisdom of veteran college faculty with whom the author has worked. Themes from the bestselling previous editions remain, but are revisited and expanded with the perspective of an additional decade in the classroom. This authoritative guide is now even more comprehensive to better serve teachers looking to improve. Whether you are new to the classroom or are looking to rise to new challenges, The Skillful Teacher will provide answers, expand your repertoire of techniques, and invigorate your teaching and your classrooms. STEPHEN D. BROOKFIELD is the John Ireland Endowed Chair at the University of St. Thomas in Minneapolis, Minnesota. For more than 45 years, he has taught in England, Canada, Australia, and the United States. 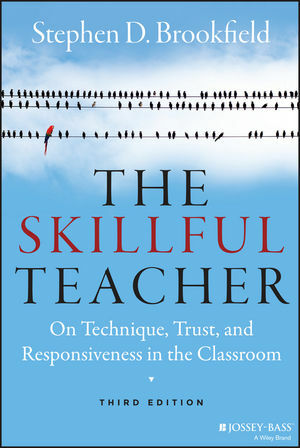 A six-time winner of the Cyril O. Houle Award for Outstanding Literature in Adult Education, he is the author or coauthor of numerous books on teaching, including Engaging Imagination, Teaching for Critical Thinking, Powerful Techniques for Teaching Adults, and Discussion as a Way of Teaching, all from Jossey-Bass.